Many modern towns and cities throughout Europe recognise that providing space for cycling creates efficient and attractive places to live. They experience the benefits that this brings, in terms of attractive streetscapes, economic use of land, simplicity of moving around, and healthy lifestyles. 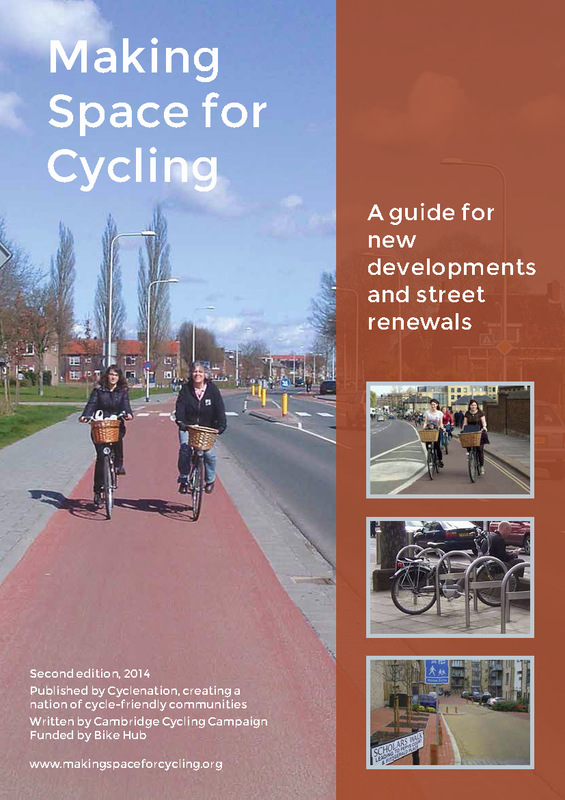 Making Space for Cycling is the definitive guide for developers on achieving this in the UK. We explain the different way of thinking that is needed. The patchy inadequate provision that has characterised most developments in the UK in recent decades has failed. 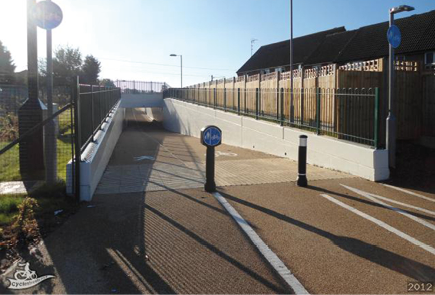 We show how high-quality cycle infrastructure leads to high levels of cycling and the benefits this brings. 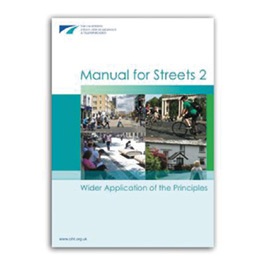 This guide covers the design principles required, from main roads down to local streets, as well as complementary measures such as cycle parking. These 36 pages will change your view of cycling, showing it to be a mainstream and desirable mode of transport, helping create a successful development. 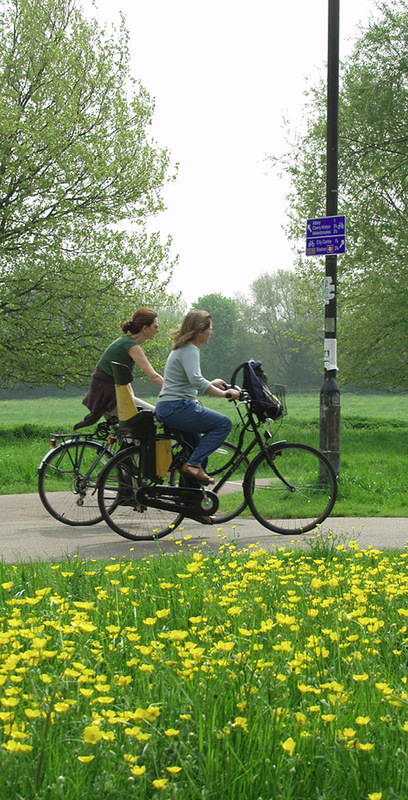 Many modern and attractive cities, both in the UK and throughout Europe, incorporate high levels of cycling. They recognise the benefits that this brings in terms of pleasant streetscapes, simplicity of moving around, and healthy lifestyles. These cities offer a compact yet spacious environment that attracts families to live there. In these cities, where 30 to 40 per cent of journeys are by bike, cycling is a normal, everyday activity. Because the cycle network coexists with the road network, people can still choose to drive for other journeys. 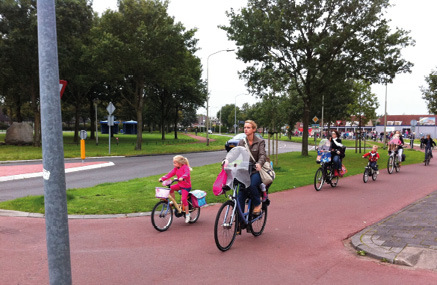 Both adults and children appreciate the independence and ease of travel that cycling provides. Cycling is completely mainstream. In this guide, we set out the different way of thinking that is needed. The patchy, inadequate provision that has characterised most developments in the UK in recent decades has failed. 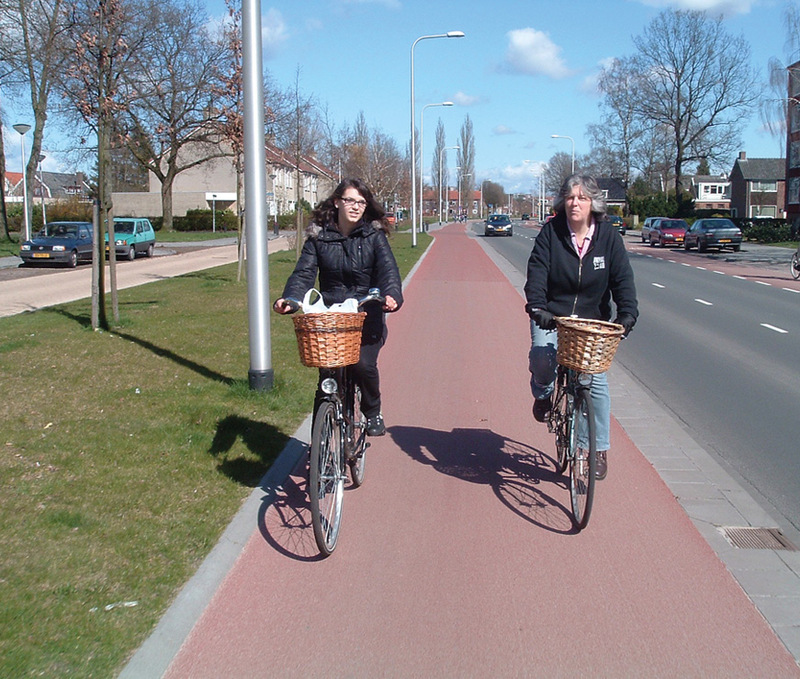 We demonstrate how only high quality infrastructure will generate high levels of cycling. We show how different this is to the current, outdated practice in the UK. The key to enabling high cycling levels is excellent quality infrastructure, appropriate to the location, as well as bicycle parking. People don't like mixing with heavy traffic. 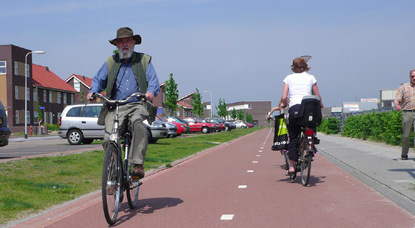 Space for cycling is needed, away from motor vehicles, with care taken in relation to pedestrians. For instance, mixing cycles with pedestrians on narrow footways is never acceptable. In new developments providing for cycling will free up space that can be used for more productive things, such as houses, shops, or public space. The ease of cycling, and the casual interaction that this brings, makes it easy for people to visit shops and chat with friends, fostering the sense of community which is an essential element in a successful new development. 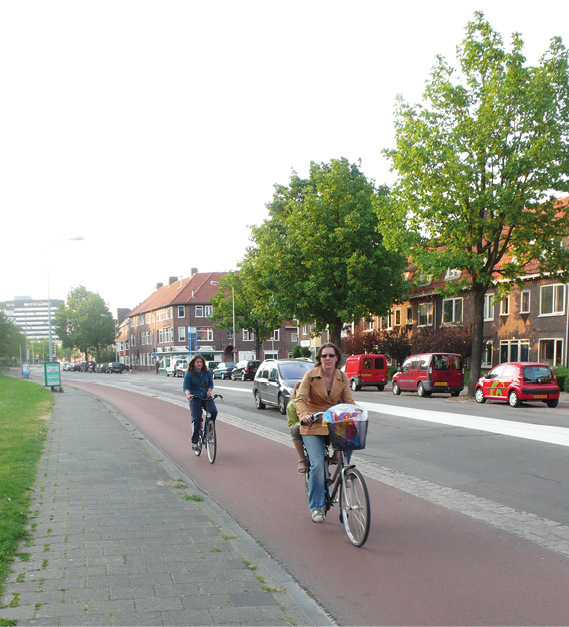 For street renewals, designing for cycling brings the opportunity to create better spaces for people. For new developments, this same approach to placemaking avoids opposition arising from concerns about high volumes of car traffic and the resultant noise and pollution. To obtain these benefits, new developments and street renewals should design for a third of all journeys to be made by bike. This is achievable if the right design approach is applied, as this guide explains. People are motivated to cycle because it is faster than being stuck in a traffic jam, journey times are highly predictable, and it is a fun and social way to travel, providing an easy way to introduce healthy exercise into a daily routine. Only by providing proper cycling infrastructure can these benefits be achieved. "I get complete reliability of journey time when I cycle to work - I'm never stuck in a traffic jam"
"it's fun chatting to other mums after dropping the kids off at school"
"changing an office car park with 400 spaces to a combined 200-space car and 200-space bicycle park reduces land area requirements by 45%." More attractive streetscapes and development: streets are less dominated by traffic and parked cars - making places that people want to be in. Family-friendly environment: children and adults can move around safely and independently. Lower cost of living: the need to own and run several cars is reduced. 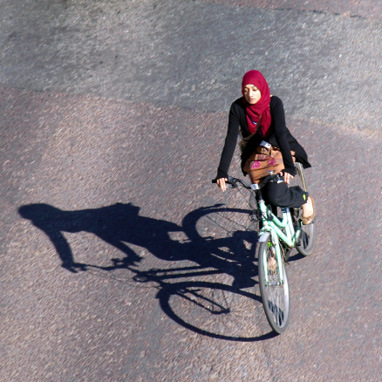 Increased access to employment: cycling is accessible to everybody, including those on lower incomes, increasing the range of access to employment opportunities. Increased productivity of local companies raising more taxes: employees who cycle to work are more alert when arriving at work and 15% more productive. Healthcare costs are reduced: cycling just 20 minutes a day will significantly reduce the risks of many diseases and provides a person's daily exercise needs, reducing healthcare budgets. Increased access to public transport infrastructure: cycling increases the effective catchment area for each public transport stop. Reduced costs for maintaining roads and car parks: less wear and tear on the roads and fewer drainage issues. Reduced crime as more eyes and ears are on the streets: more people cycling increases natural surveillance and community interaction, making the streets feel safer. Reduced collisions: streets are safer when more people cycle. Cycling requires a smaller area of land per capita: the need for wide roads and large car parks is reduced. It facilitates higher densities without overcrowding: houses need less car parking. The impact of external traffic impact is reduced: less opposition from surrounding settlements worried about high volumes of car traffic and the noise and pollution that this brings. A place and community where people want to live: safe, family friendly, accessible, peaceful. Easier to gain approval from planning authorities: strong fit with public policy objectives. 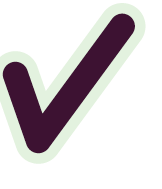 Easier to achieve conformance with NPPF: the principles outlined in this guide are strongly in line with NPPF Section 4, Promoting Sustainable Transport. Towns and cities with an efficient transport network and high levels of cycling have achieved this by investing in cycle infrastructure. Cycling is seen as something that everybody can do, easily and quickly. This commonplace mode of transport is used for every type of journey: work, shops, schools, leisure. 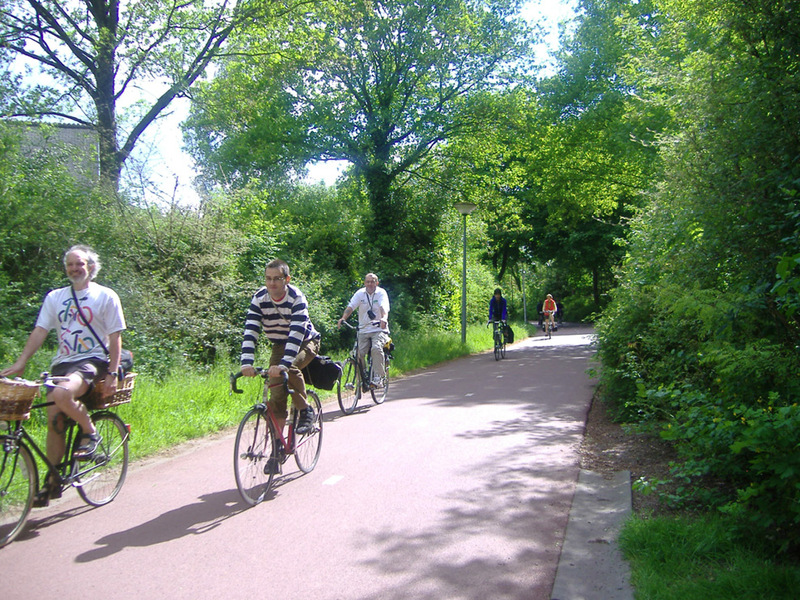 Direct cycle routes between housing areas and major destinations make cycling the most pleasant and easy way to travel around. Convenient cycle infrastructure means avoiding stop-start travel caused by obstructions, lack of priority, and narrow pavements shared with pedestrians. Good cycle parking completes the journey. Speed of travel on a bicycle can be quicker than by car through an urban area if cycling infrastructure is made integral to newly-designed streets. 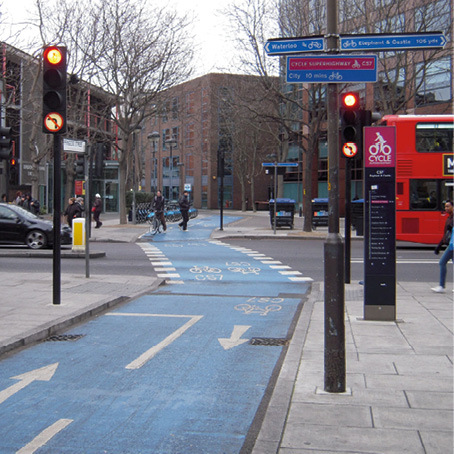 Almost all British cycle infrastructure has failed to recognise these three requirements. Simply putting blue signs on pavements does not provide a direct, convenient or fast way to get about. 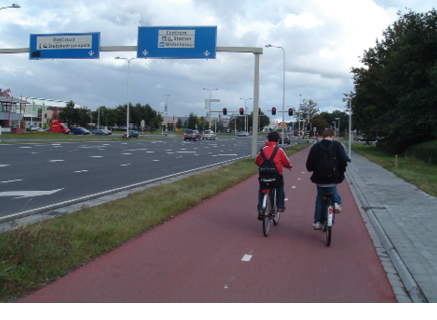 Cycling, walking and driving need different networks with design requirements. This framework is needed where there are significant volumes or speeds of traffic. The main primary roads through an area will need proper cycle infrastructure, whereas local residential streets should be designed so that people can mix safely. Providing space for each of these groups avoids conflict between them, increasing subjective safety, making cycling the instinctive choice. In this guide, we show what this looks like in practice. 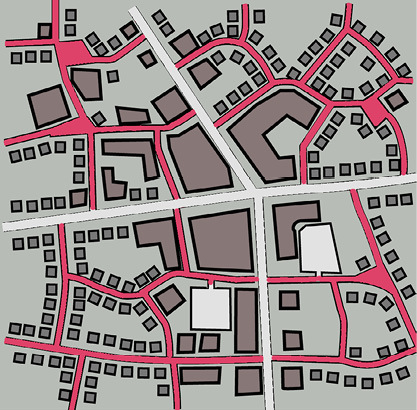 Permeable street networks facilitate direct movement around an area for walking and cycling. 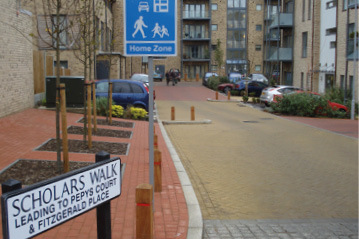 New developments should therefore aim for traditional street layouts because they are more successful in all sorts of ways – socially, environmentally and in general efficiency terms – than cul-de-sac housing developments. Similarly, street redesigns should incorporate new openings and cut-throughs where possible. - mixing with traffic puts people off cycling, especially children. 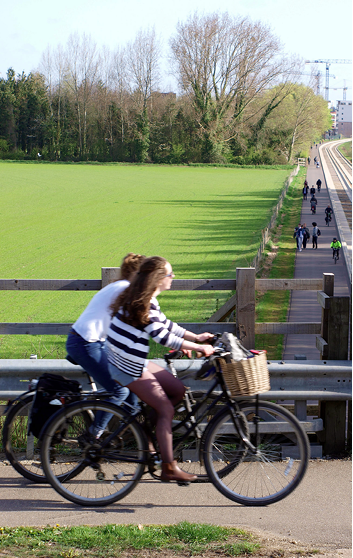 Cycle lanes and tracks at least 2.1m wide, away from traffic, make cycling convenient and sociable. We explain this key requirement, and the available options, on pages 16-18. - maintains momentum, and routes are shorter and wayfinding is easier. - shared-use pavements alongside roads benefit nobody. Such pavements are inconvenient, slow, and misappropriate space from pedestrians. 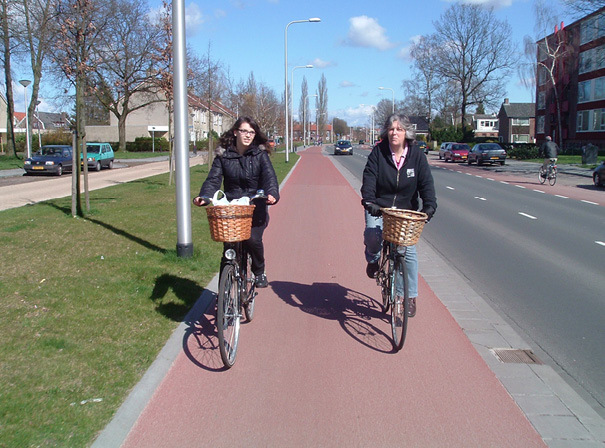 Shared-use should not be created alongside roads. - stop-start cycling is very hard work. Cycle infrastructure should never involve 90º angle turns but instead should aim towards smoothness of movement. Cycle tracks along a road must not give way at every side road or driveway. Crossings should detect the presence of cyclists, like most traffic lights. 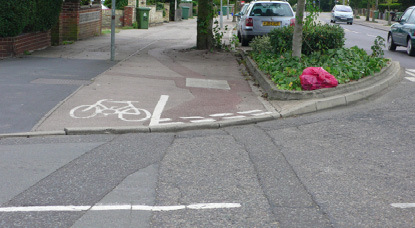 Avoid stop-start cycle infrastructure like this. - cycle infrastructure should be designed to allow people see each other regardless of what type of vehicle they are using. – a route with constantly varying heights requires more effort to ride on and is less comfortable. At driveways and junctions the cycleway should not change height. no driver would tolerate trees, wheelie bins, utility boxes, or lighting poles in the middle of the roadway. Obstructions of any kind make cycling much more difficult, especially for those with disabilities, or using tricycles or trailers. Obstructions and pavement paths are problematic. - safely overtaking a parked car requires a lot of skill. Car parking must be off-street rather than obstructing the carriageway. Parked cars result in dangerous manoeuvres. - good quality cycle parking is essential for the start and end of a journey. This means providing secure stands near the entrance to a building and on-street. 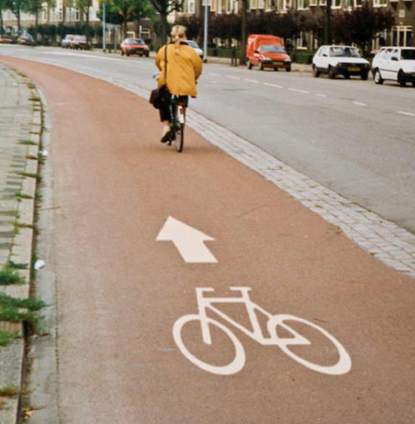 - cycle tracks should be laid to the same quality as roads. They should be designed to facilitate easy maintenance, to avoid overgrowing vegetation and enable winter treatment. Would a driver tolerate a tree in the middle of a road? Different streets or roads perform different roles outside and within an area and therefore need different solutions to facilitate cycling. – these residential and similar streets form where most people live and work. They typically have speed limits of 20mph, with no through motorised traffic. – these roads and streets are the major traffic routes that accommodate high volumes of motor traffic. Primary roads/streets typically have speed limits of up to 30mph or volumes of traffic of more than 400 motor vehicles an hour. Secondary streets may have lower design speeds or volumes of traffic of less than 400 motor vehicles an hour in both directions. – high-speed roads, such as a trunk road or motorway, that move traffic long distances between urban areas. These typically have speed limits of 50mph or higher. – dedicated bicycle and walking routes. These are separated from roads by at least a 5 metre gap. 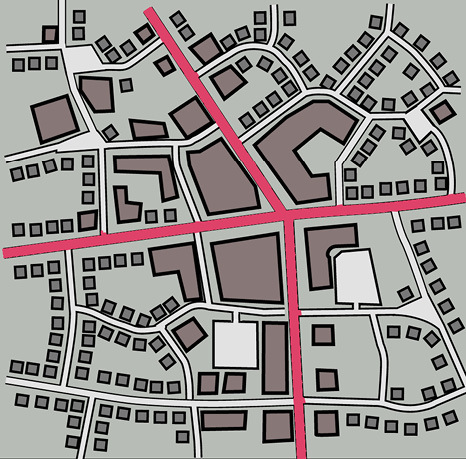 The majority of streets within an area are local streets where people live or work, shop or enjoy themselves. As well as being quiet and inherently safe for cycling, these will have a family-friendly environment, ideally with children able to play in the street. The principles we outline here strongly accord with those in Manual for Streets 2. Car traffic should be minimised as much as possible by avoiding rat-runs that create through-routes for cars, lorries and other motorised traffic. By contrast, permeability for cycling and walking must be maintained. There are a variety of design solutions that should be employed to civilise these streets and thereby make them highly attractive to potential residents. Speeds should be kept low through design. A key way to achieve this is to avoid excessive forward visibility, i.e. not making the roads too straight. As a result, these areas should not require any specific cycle infrastructure. If speed humps are required, they should be of the sinusoidal type and should always include a cycle bypass to the side. Parking of cars should be discouraged from local streets; instead, parking areas within the curtilage of the property or within a nearby neighbourhood parking area enhances the general street environment. Where on-street parking is provided in new developments, it should only be allowed in designated parking bays. 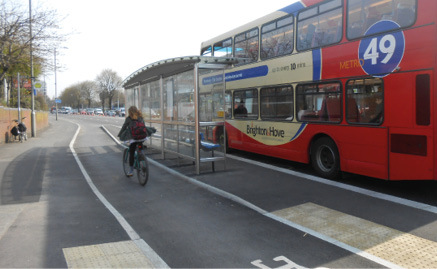 These bays should not detract from the ability to cycle safely, e.g. requiring people to swerve around parked vehicles. One way to achieve this is to intersperse parking bays with trees. 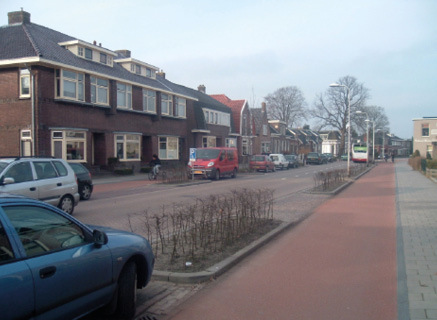 Home zones are residential streets that give priority to people over vehicles. Best practice for local streets with no through motor traffic is for a single level surface with minimal traffic signs and lines. An excellent way to restrict through traffic, while automatically promoting walking and cycling, is a simple point-closure. These are cheap and simple to create. 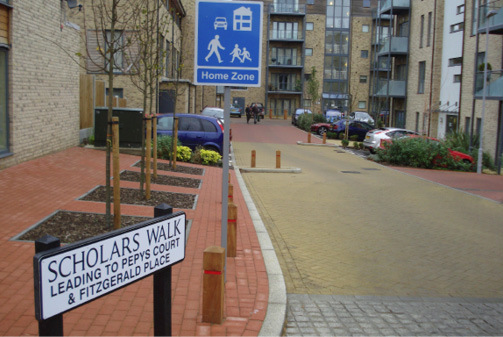 Where bollards are used, only use an odd number of simple bollards spaced about 1.8 metres apart, arranged to separate opposing flows, not to obstruct them or force them into conflict. 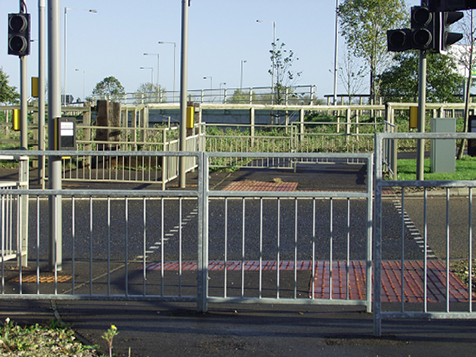 Never use gates, chicanes, or similar pinch points as these exclude many legitimate users, such as people with disabilities. The risk of motorbikes using these routes is not great enough to restrict free movement of larger bicycles or pushchairs and wheelchairs. Parked cars must not block the movement of people through the bollards. 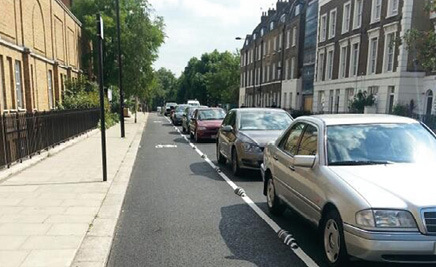 If one-way streets are used, cycles must always be exempted by provision of a contraflow. Such permeability is achieved by using a 'No entry except cycles' sign. Some local streets can have all motorised traffic removed, leaving just a wide footpath and a 5-metre wide central two-way cycle track. These are most appropriate in shopping areas and along routes to schools, railway or bus stations. Primary roads/streets carry the most traffic. Cycle traffic will be high on these routes as these will also be the most direct routes between areas. Significant attention must be given to the design of these streets, as correct design will be crucial for enabling people to cycle. Secondary streets connect the primary streets to local streets in residential and commercial areas. They are designed for relatively lower volumes of car and cycle traffic. They will be narrower and have lower speeds than the primary streets. As traffic volumes will be lower, less infrastructure is required, and the level of separation of cycles and other vehicles can be lower. People do not like cycling amongst traffic, or mixing with pedestrians. Therefore the primary requirement, which will make cycling an easy choice, is to provide dedicated space for cycling on streets carrying most traffic. At least 2.1m of dedicated cycling space must be provided on each side of the road, with some degree of protection from traffic. All cycle tracks along primary streets should have priority over side roads, including junctions with secondary streets. The cycle track and footway must not change height across this junction. Junctions are the most common location for collisions. A well-designed junction reduces the number of decisions that need to be made by each road user. 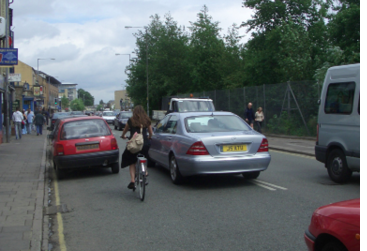 Providing space for cycling, that minimises conflict points, will prevent collision blackspots. People do not like cycling amongst traffic, or mixing with pedestrians. Therefore the primary requirement, which will give people the choice to be able to cycle, is to provide dedicated space for cycling on streets carrying most traffic. 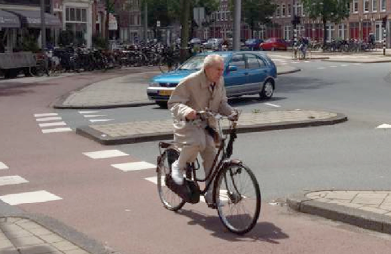 Infrastructure must be suitable for people cycling fast or slowly. At least 2.1m of space must be provided on both sides of the road, with some degree of protection from traffic. Priority at sideroads (see later) is essential. 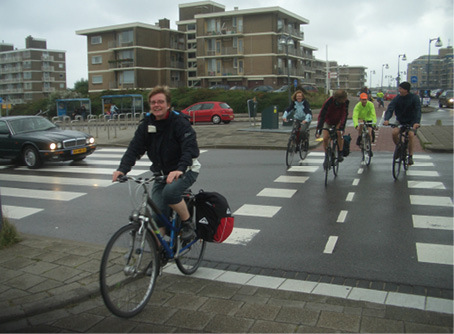 The best practice option is the use of segregated cycle tracks. This is the model used very successfully in the Netherlands. These need to be 2.5m wide (minimum 2.1 metres) on both sides of the road, machine-laid, and separated from the main carriageway by at least one metre of green space (or car and cycle parking). Kerbing needs to be forgiving (shallow and/or angled) to avoid accidents, and also to allow the maximum width of track to be used. An alternative option is hybrid cycle lanes. These are found in Denmark and Sweden, and now feature in DfT guidance. They are on-road cycle lanes that have some kind of physical demarcation to provide the feeling of protection that less confident cyclists want. Cobbles or another kind of informal segregation is needed. These 2.5 metre (2.1m minimum) cycle lanes are smooth, and raised slightly above the level of the main road surface. Red tarmac should be used. Footpaths to the side should be a separate construction and raised slightly above the level of the cycle lane. What are the key aspects of this provision? Good width, easy to cycle side-by-side. 2.5m width (2.1m minimum). 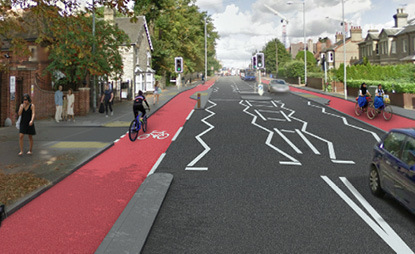 Should have a distinct colour, using coloured tarmac (not painted). Suitable for everyone: fast or slow, novice or experienced, able-bodied or disabled. Remember the three networks: people walking should have their own footpath, separate from the cycle track. Parking bays must always be between the cycle track and the traffic lanes. Special care must be taken around bus stops. Space must be provided for pedestrians waiting for or exiting a bus. The cycle track must be continuous, away from the waiting area. This layout is sometimes called a 'floating bus stop', and is very common in northern Europe. 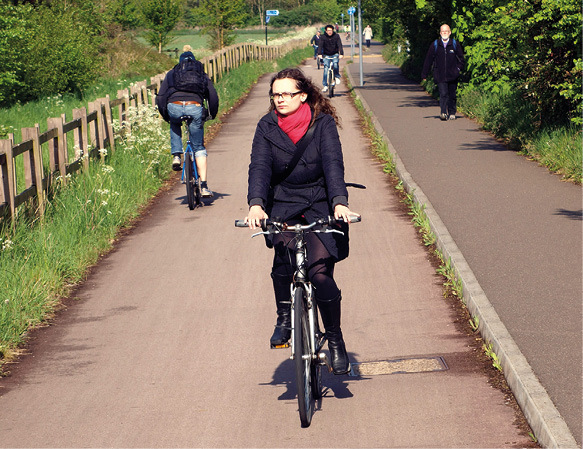 of the cycle tracks is recommended: higher than the road surface, but lower than the footway. 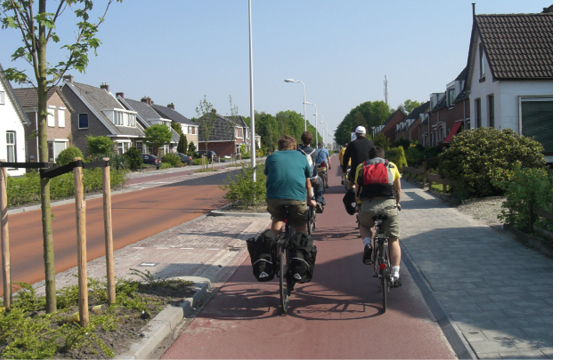 are appropriate for primary streets if sufficient segregation of cycles is provided. Junctions with sideroads are still important junctions. Any cycle infrastructure that runs alongside a road must be continuous: in other words, it must maintain priority over every sideroad. Having to stop and give way at a side road makes cycling much harder work, because of the continual loss of momentum. Imagine how irksome driving would be if there was a traffic light or 'give way' at every side road. The cycle track and footway must not change height across this junction. Priority for cycle tracks alongside a road works best when those cycle tracks are uni-directional. This means that drivers do not need to make additional checks for cyclists crossing, because cycles will be going in the same direction as cars. The adjacent footway should also provide continuity for pedestrians as per the cycle track. This design reinforces the Highway Code rule on pedestrian priority at side roads. 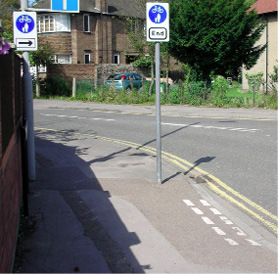 A small waiting area for cars is needed, so that drivers do not block through-traffic while waiting for a cyclist crossing on the opposite side of the road. Raised red crossings are an appropriate way of stressing priority. For hybrid cycle lanes, simply continue the lane across the junction, as if it were another traffic lane, maintaining the red surfacing. Junctions are the most common location for collisions. A well-designed junction reduces the number of decisions that need to be made by each road user. Providing space for cycling, minimising conflict points, will prevent collision blackspots. 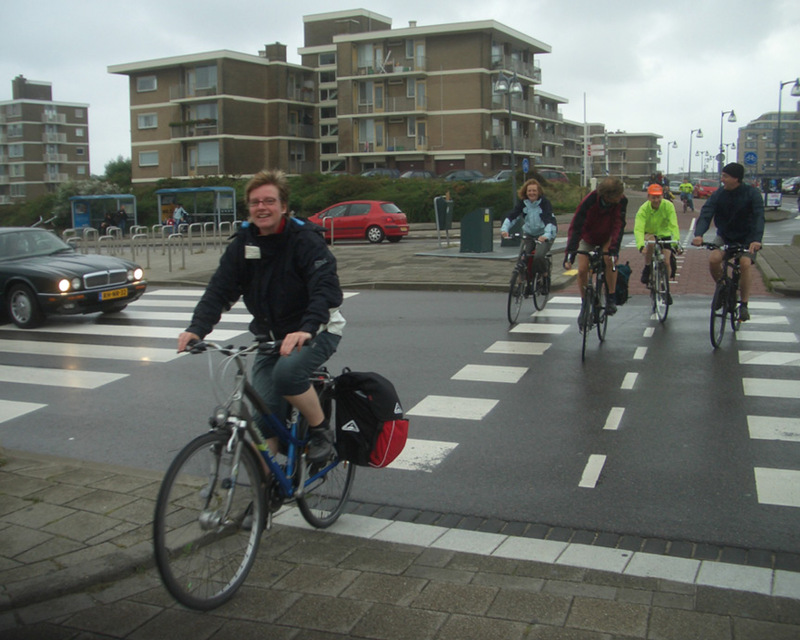 Junctions that feel subjectively safe will increase the likelihood of people cycling. Owing to the lower volumes of traffic, simpler junctions can be used on secondary streets. Multiple lanes of traffic, which are inherently difficult to negotiate by bicycle, should be avoided. Reducing traffic speeds through the junction. Allocation of dedicated space for cycling must continue through the junction, so that people experience a joined-up route that avoids unnecessary mixing with traffic. Cycle lanes should be marked across the junction to indicate the space a cyclist requires and to reduce the likelihood of collisions with left-turning vehicles. A key principle in safe street design is that a road user never has to look in more than one direction to move safely negotiate part of a junction. The best practice panel overleaf suggests a video illustrating these important points. For maximum safety, cycle tracks should not cross more than one lane of traffic or traffic flowing in multiple directions, without a safe refuge where cyclists can wait. Cycle refuges, at least 2.4 metres in length, should be provided between these traffic lanes. If this is not possible, then signalisation or grade-separation of the cycle routes must be used to provide sufficient safety. Having to stop and give way constantly makes cycling very tiring and unattractive. Adding blue signs to a pavement around a junction is not in any way an effective or useful cycle facility. 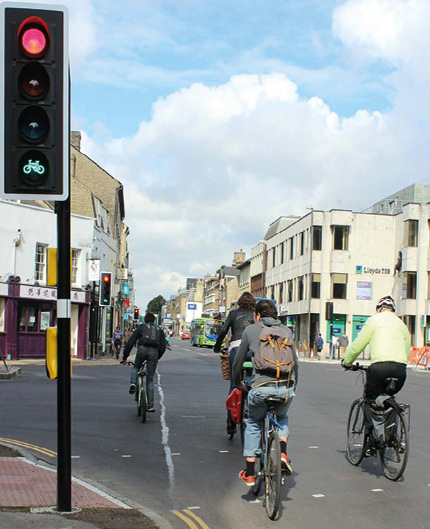 Signalised junctions should reduce the waiting times for bicycles, by having more frequent but shorter timings for cycle traffic. Waiting times of over 30 seconds make cycling slow and unattractive. 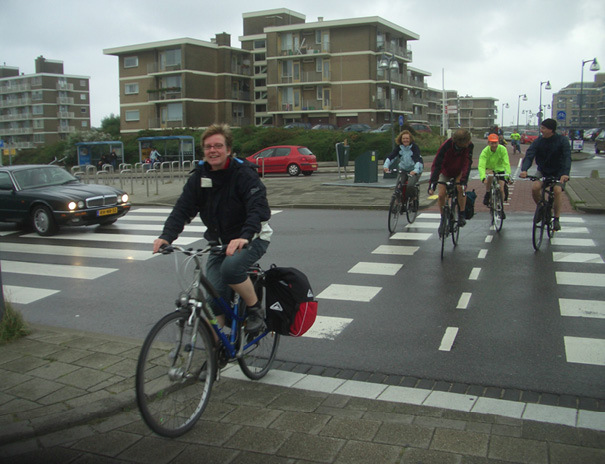 The bicycle traffic should have the same direct routes over the junctions that cars do. Consideration should be given to using innovative traffic signals such as: (i) advanced green cycle signals, or (ii) simultaneous green phase for bicycles. Grade separation can be provided using tunnels or bridges. Tunnels are preferred but only if the sight lines through the tunnel are sufficient that you can see into and out of the tunnel before entering. Bridges should be as straight as possible with gentle ramps. Consider raising the road up to reduce the depth of the tunnel, or consider lowering the road to reduce the height of the bridge. Sadly, there are very few junctions in the UK that display best practice for cycling, hence the continuing high level of collisions. Designers must consider looking to solutions employed abroad if junction safety is to be addressed seriously. Increasingly, the DfT is considering allowing these onto UK streets. Consider using a one-way bicycle-only roundabout with cycle traffic moving clockwise around the outside of the traffic junction. 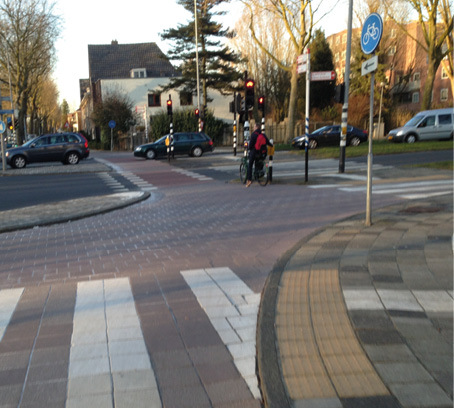 Note how, in the Dutch design, a standard four-way junction for vehicles effectively has a bicycle roundabout around the outside. This is an example of the principles in practice. Cycling is not permitted on motorways. However, major roads will normally follow the fastest route between two urban areas. An equally desirable, direct route should also be available for leisure and commuting cycle trips. 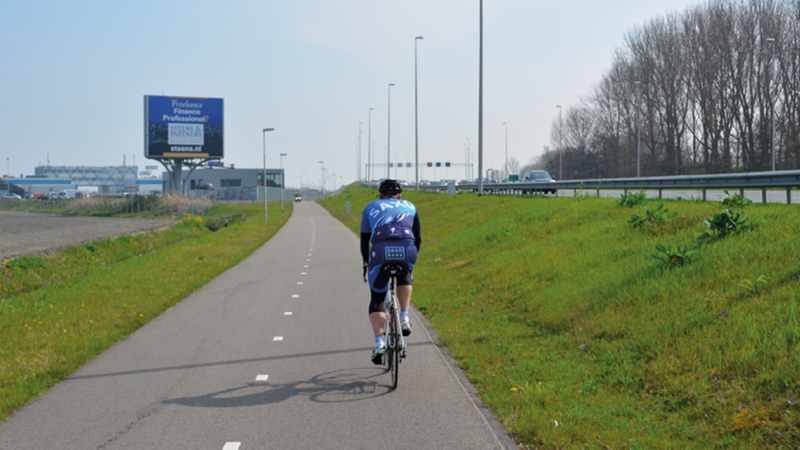 Cycle tracks along major roads must always be fully segregated with a distance of between 4 and 8 metres from the main carriageway. This provides sufficient overlooking from cars to provide visual safety whilst also being far enough away to reduce the noise of the traffic. Ideally trees should be planted in this space. 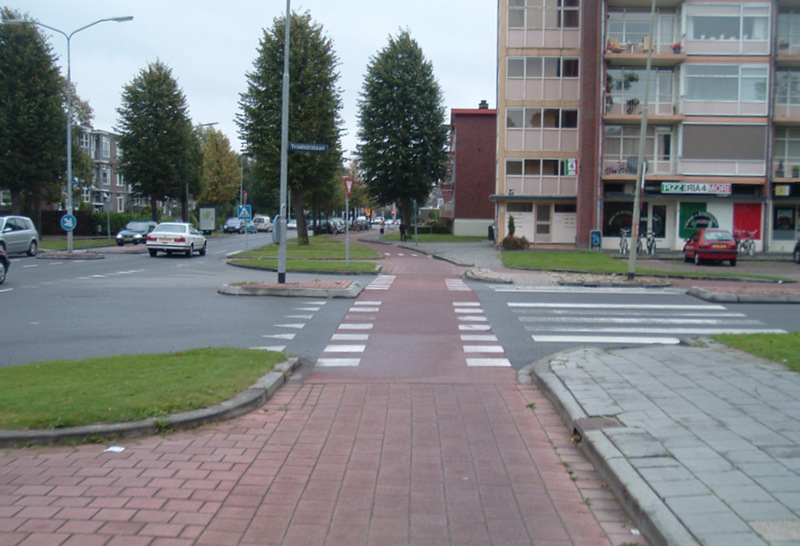 Paths need to be designed to the high standard shown in the picture above. They should be smooth, generally uninterrupted, and designed to avoid the need for maintenance. They should be a minimum of 5m metres wide, and have a marked centre line, to allow a faster cyclist to overtake a slower one safely without conflict with oncoming cyclists. Smooth surfacing should be used to ensure a solid foundation, and they should be designed to avoid weed growth at the edges or from under the path. In summary, such longer-distance paths should enable cyclists to travel as fast as they are able (i.e. up to 25mph). Where a route would also be used by horse riders or ramblers, an additional 3 metres of regularly cut grass can help reduce conflicts between people cycling and other users. These routes should be designated as bridleways. Cycle tracks along major roads within urban environment must be lit using street lights. Cycle tracks along major roads near urban areas or in the rural environment should use solar studs or low-level lighting. Major roads unfortunately provide barriers to permeability and therefore cycle tracks should be built on both sides of a major road where there are few places to cross safely. There may be cases where specific cycling and walking routes can be created to act as shortcuts between parts of a development. For instance, such links are very useful between the corner of a development and a primary street at the edge of a development or joining up other parts of the built-up area. Such routes should be at least 5 metres wide to ensure that people walking and cycling have enough space to pass each other safely. Bear in mind that natural interaction is best when people can talk to each other, i.e. two-abreast, hence the need to avoid a narrow width. Public art is often featured on such routes. 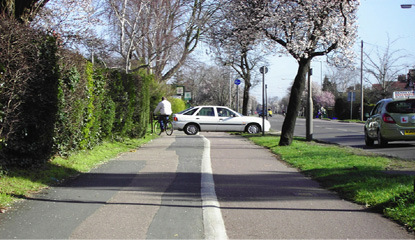 When sufficiently wide, sometimes these paths are best split into separate walking and cycle areas, separated by a painted centre line or even a sloped kerb with a 50mm up-stand between the two surfaces. If space permits, an area of grass between the two may be appropriate. To help ensure easy maintenance, a strip of at least 1 metre on each side should be planted as grass. Bushes and trees should only be planted outside of this maintenance strip and be trimmed at least three times a year. Access to these routes by maintenance vehicles must also be considered. 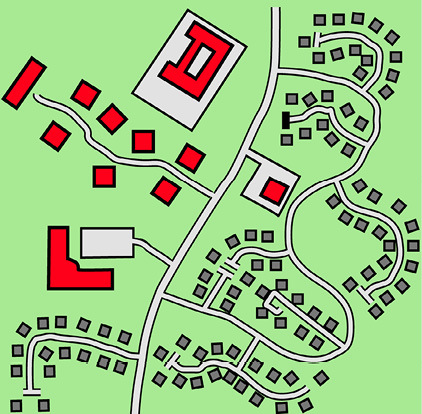 Cut-throughs between rows of houses are also important in creating this secondary network. They should be wide and well-lit, with good visibility. 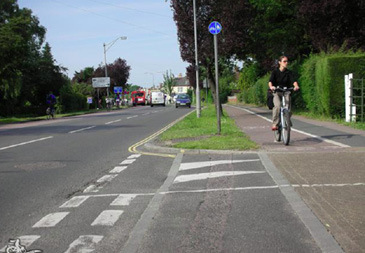 Where a cycle track joins a road, the environment should be barrier-free, should promote good visibility, and the kerbs must be flush - to avoid unpleasant bumps or risks of falling when approached at shallow angles. Flush means an upstand not greater than 5mm. A traditional dropped kerb with an upstand of 10mm or more is NOT acceptable. Such routes can be termed the 'secondary network' which complement the normal network of local and primary streets. These again help make cycling and walking the natural choice. These routes are also good for children learning to ride. 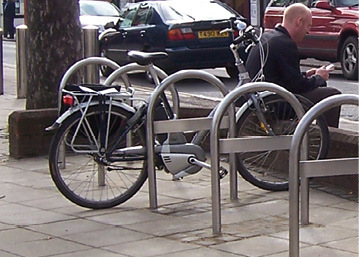 Cycle parking is a key component in helping people choose to cycle. Having a bike in a convenient but secure location near the front door, nearer than any car, is a great way to make people use their bike automatically, particularly for local journeys to shops and other amenities. 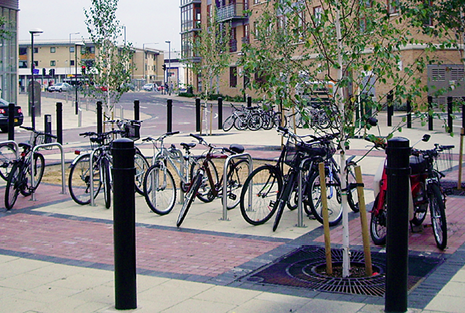 Cycle parking is also an extremely efficient use of space, compared to car parking. 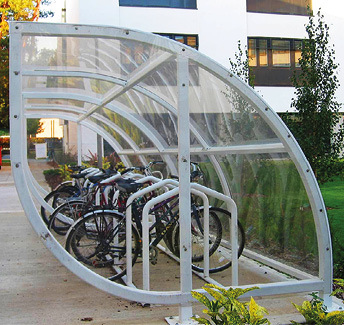 In planning applications, never refer to 'cycle storage' – use 'cycle parking', which reflects the concept that cycles will be used regularly. 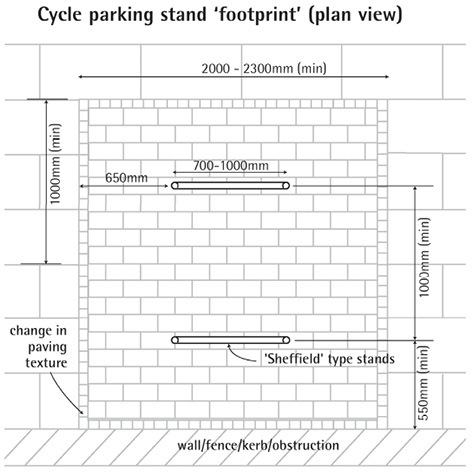 The cycle parking guide referenced on page 34 contains a set of technical drawings and more information on cycle parking. Convenience: Part of the beauty of cycling is that it can be quick and convenient, so cycle parking should be located near main entrances. Security: It must be possible to lock the frame of the bike securely to an immovable object, namely a cycle parking stand. Quantity: There must be sufficient cycle parking for the number of residents or, for amenities such as shops, the likely number of visitors and employees. Sufficient space: There must be sufficient space for people to approach and leave the cycle parking easily. Squeezing bikes into too small a space reduces capacity as stands cannot be reached or used. A key aspect of providing cycle parking is location. Cycle parking should be easier to access than the equivalent car parking, to reflect their frequent use for short trips, encouraging people to cycle rather than take the car. 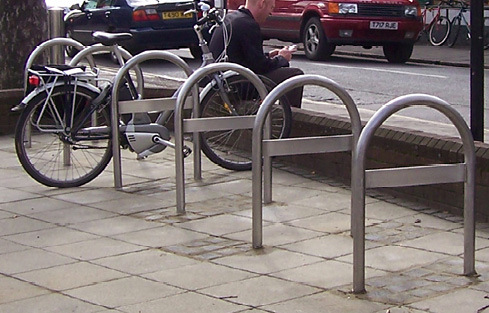 Cycle parking is needed at all types of locations: residential houses and flats, workplaces and businesses, shops, schools, local amenities, and entertainment venues. Spaces should be included for visitors: for instance, workplaces need an allocation for both employees and visitors. Have a balance of 75% convenient, 25% high-security cycle parking: sometimes it is useful to provide a lockable cage as part of a car-parking compound. This is useful, but in practice many people prefer convenience over the increased security. 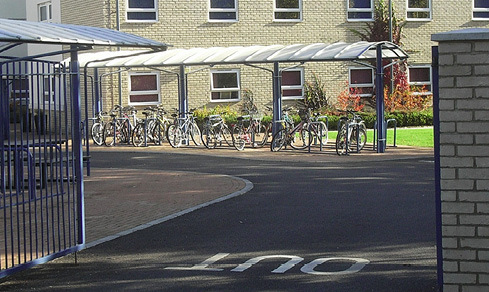 Cycle parking must be near the entrance: 50 metres from each entrance to a building should be considered the maximum, or bicycles will be left untidily and insecurely. Cycle parking should always be at ground level: if this is impossible, a cycleable (shallow) ramp is essential. Cycle parking must never be accessible only via stairs or a lift. It must always be step-free, for both usability and disabled access reasons. Visibility is important: if it is overlooked, and conveniently located, the likelihood of theft is naturally reduced. Lighting - consider movement-activated security lights. 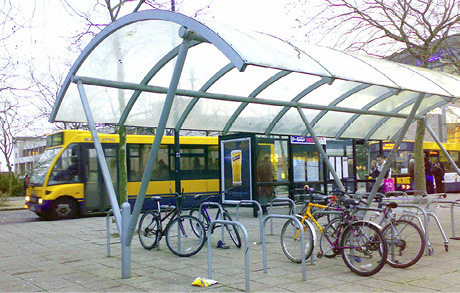 Cycle parking is particularly important at transport interchanges: for instance, providing cycle parking next to bus stops increases the accessibility of the bus network. The required quantity of cycle parking is typically underestimated within new developments or when improving streets to encourage cycling. 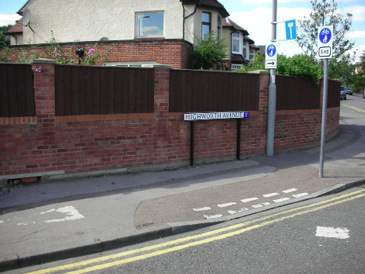 In some Local Authority areas, Cycle Parking Standards are set out in the Local Plan for new developments, and these will be a significant objective consideration that the development must meet or exceed. The number of cycle parking spaces should at least match the number of car parking spaces throughout a development. For schools, it is expected that three-quarters of children and staff should be able to park their bicycle at school. For office and industrial sites, it is expected that at last half of the workers should be able to park their bicycle at work. For retail, it is expected that at least half of the staff and visitors should be able to park their bicycle. For train stations, 5% of all residents living within 5km should be able to park their bicycle. For housing, there should be space to park at least one bicycle for each expected resident. Ensure there is space allocated for potential future expansion. 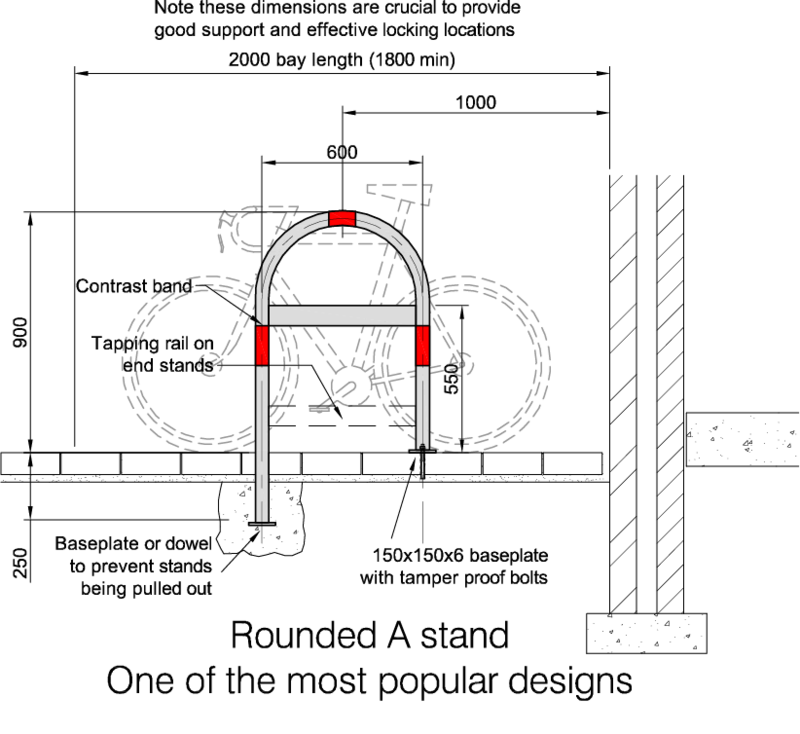 Use only stands to which the frame can be locked. Anything else is useless as the bike can easily be stolen and insurers may refuse to cover such loss. Allocate sufficient overall space. 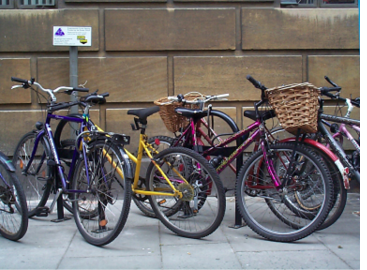 As a rule of thumb, eight cycles (four stands) can be parked in the space of one car. For 40 cycle parking spaces, 100 square metres of space needs to be allocated. Install the stands at least one metre apart. Ensure there is space for people to approach and leave the cycle parking easily. A 1.8 metre wide access path is needed. Ideally, cater for a range of frame sizes, e.g. children's bikes and those with baskets. Consider adding a covering for shelter, and to keep bikes dry. 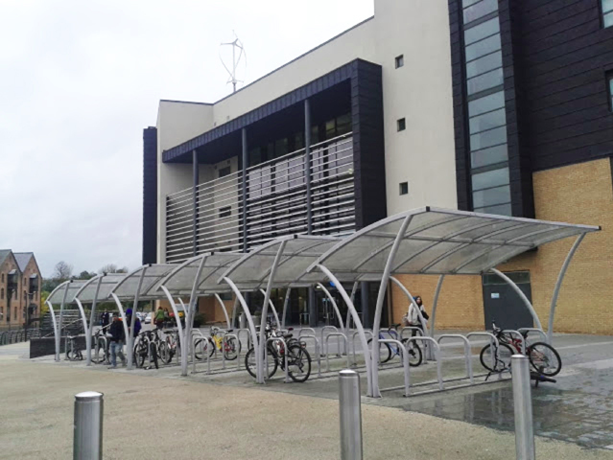 Ideally, cycle parking should be provided at ground level within a secure area of the building that only residents or employees have access to. If cycle parking on the ground level is impossible, a basement bicycle parking structure would need to be accessed via a shallow ramp. Lift access would be needed in addition to the normal access, and must be large enough for two large bikes or a cargo bike to enter. There are a variety of possible cycle parking solutions for homes. The key requirement is always to ensure that cycles can be parked near the main entrance. Possibilities include providing additional space within a utility area so bicycles can be parked within the house. 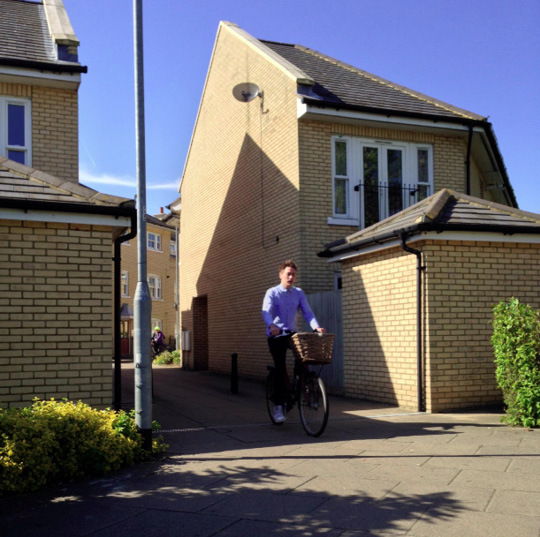 For larger houses, a slightly longer and wider garage could accommodate the additional bicycles. Areas of cycle parking within the streetscape work well. Although these are not as secure as a fully-locked compound, in practice, people will often prefer the convenience of this arrangement. We recommend a balance of 75% convenient, 25% high-security cycle parking. Allocate 100 square metres of space for every 40 cycles parked. A genuinely cycle-friendly environment, if done correctly, will be naturally pedestrian-friendly. However, much current practice seen around the UK unnecessarily puts cyclists into conflict with pedestrians. Cycling and walking have different needs. However, they both share the desire for direct, pleasant routes and the ability to stop easily at local shops or destinations. 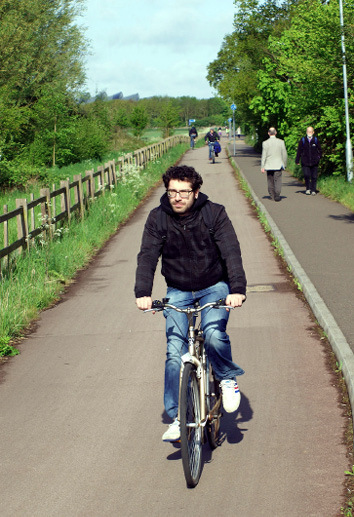 Cyclists should not be sharing paths alongside roads with pedestrians. These are totally inappropriate in new developments and in street renewals. Neither group likes such provision. Pedestrians do not like cyclists approaching unannounced, and cyclists do not like being slowed down by pedestrians. Paths across parks and green areas should always be allowed for cyclists to use, and be 3m width minimum. The only other time shared paths may be appropriate is on key routes between major areas, or in rural areas, and these should be at least 2.5m width and of high quality. 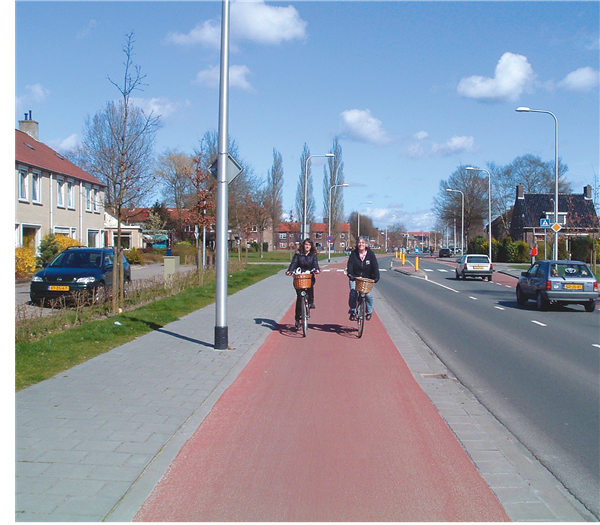 Shared use is broadly acceptable where pedestrian flows are less than 100 people per hour per metre of width. People should be able easily to distinguish the areas designed for walking from those designed for cycling or driving. 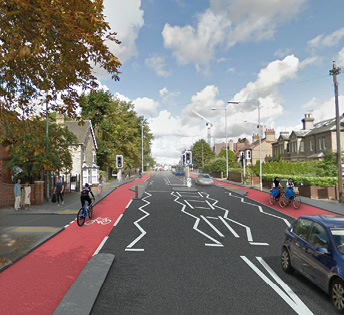 For example, segregated cycle tracks alongside roads in urban areas should normally use red-tinted tarmac (except where this would be visually intrusive), so that they are easily distinguishable from walking areas. The walking surface should be constructed from paving slabs, bricks, or setts. 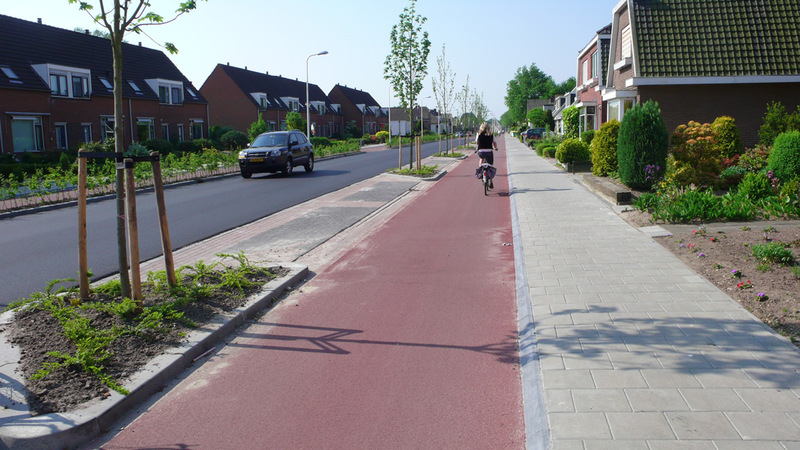 Small kerbs should be provided to raise the level of the footpaths above those of cycle tracks and then roadways. People tend to walk on the highest areas, and this should continue even if there is no motor traffic along a road. Walking routes should be as permeable as possible. There should be no dead-ends where the only way out is the only way in. There must be no place where walking is forbidden within a new development. 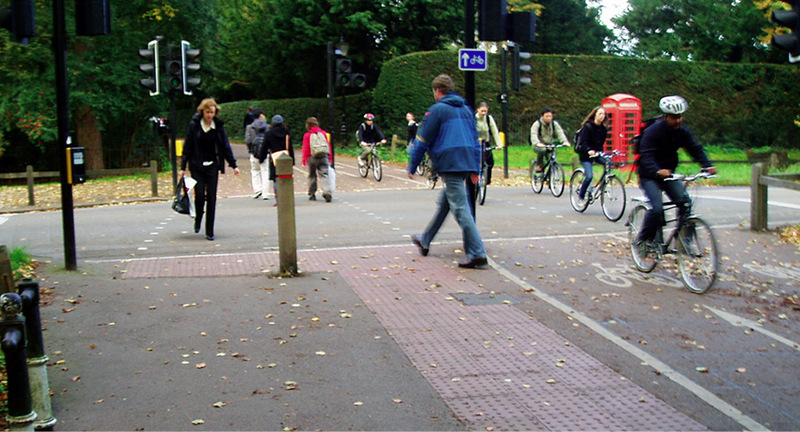 Crossings should be level: bumping up and down is unpleasant whether walking or cycling. 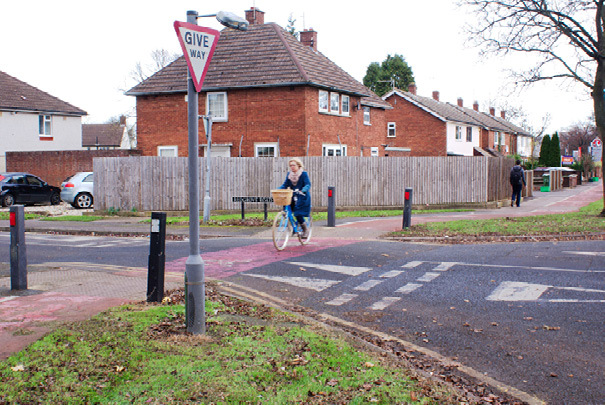 Signalised road crossings should be single-stage, with sufficient time to cross fully. A central refuge should be provided, so that people who can only walk slowly can cross over in two phases. Guard rails should never be used: it is an old-fashioned and ugly design tactic that is now discouraged in all government guidance, e.g. the Manual for Streets. 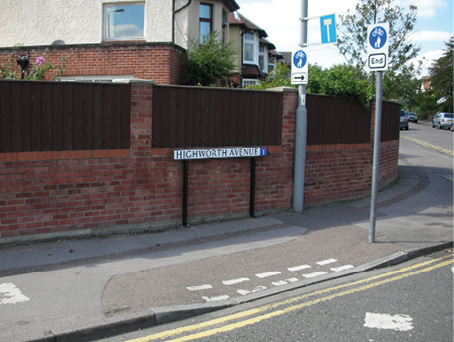 Pedestrians are annoyed by such railings by forcing them to make a detour; they often bypass them, resulting in more risky manoeuvres. Such railings also cause safety problems for cyclists, as they remove a key escape point if a cyclist has to get off the road quickly. Shared space is a design approach that seeks to blur demarcations between vehicles and pedestrians, such as by reducing road signs and markings, so as to reduce the dominance of streets by drivers. 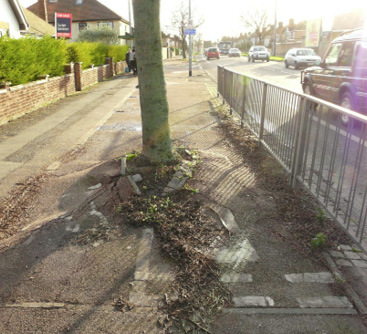 More controversially, particularly for those with visual impairments, it can mean removal of kerbs: this is sometimes called a level surface. This approach only tends to work where vehicle speeds are generally less than 15 mph, such as at junctions where there is no explicit priority for vehicles from any direction, or where the number of people using a road on foot and cycle outweighs the number of motor vehicles. Shared space is most appropriate on local streets with little car traffic. It is not suitable where there is a high volume of car traffic or where drivers may be overly assertive towards pedestrians or cyclists. 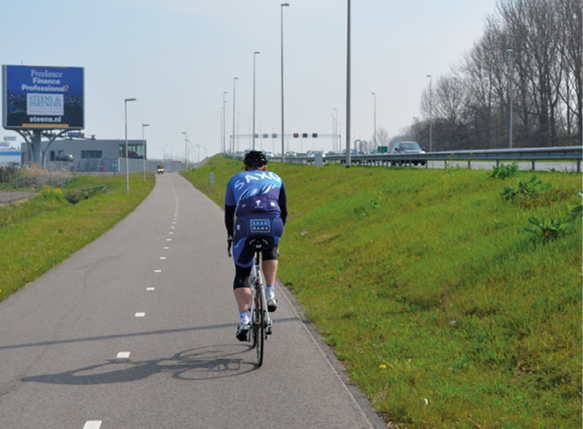 There is a range of complementary measures that go hand-in-hand with encouraging cycling. In the case of new developments, many of these could also be seen as real selling points to sway prospective buyers. Car clubs – provision of shared cars, enabling people to have access to a car (perhaps as a second car) without having to bear the costs of ownership. Car clubs reduce the need to allocate land for parking spaces. Car club parking spaces should be next to secure cycle parking. Travel planning – to help new home owners discover easy ways to get around the new development for their journeys, and places that they can visit on a bicycle, by bus, or on a train. 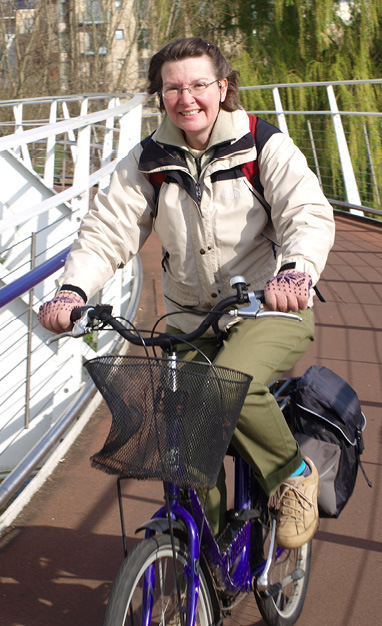 Cycle training vouchers – to encourage new cyclists, both young and older, to learn to cycle. 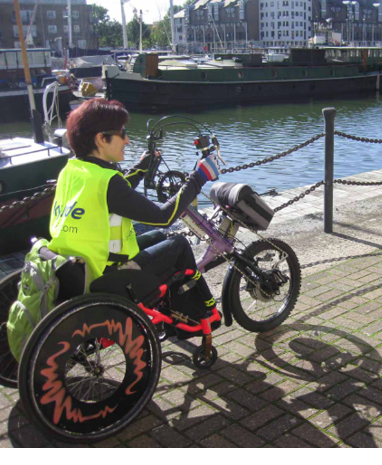 Bikeability is the national cycle training standard, provided by many companies around the UK. Community events, such as bicycle maintenance workshops, could also be organised. Providing a free bike when moving into a new house – a voucher, to be redeemed at a nearby bike shop, could be a great way to get people cycling. Bikes should be of reasonably good quality (£300 plus), as cheap bikes can do more harm than good as they may break quickly, disrupting the beneficial habit-forming for new cyclists. Smartcard bus ticketing – avoids the fuss of paying on a bus and makes journey times much quicker. 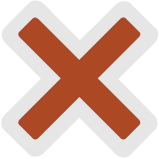 Smartcard (e.g. Oyster) ticketing has worked very well in London to improve bus transport. Real-time information for buses – a display at a bus stop showing the time until the next bus arrives gives people reassurance and confidence in using buses. Frequent bus services along the main primary routes within the development, when combined with secure cycle parking, increase the attractiveness of bus services. 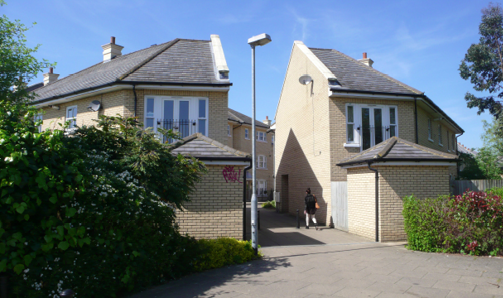 The principles outlined in this guide are applicable to a range of schemes – from street redesigns to major housing developments or new towns. 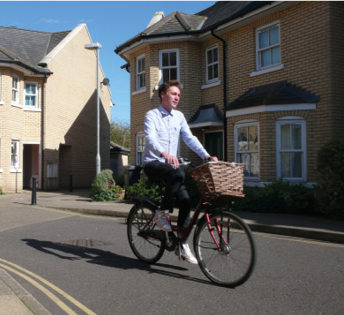 In the case of larger housing developments, significant benefits can be realised for both developers and future residents when these developments are genuinely cycle-friendly. A cycle-friendly new development is a place people want to live in: safe, family-friendly, accessible, peaceful. The attractiveness and quieter environment are a significant selling-point over competing developments. New developments planned around the bicycle will also use land more efficiently. Accordingly, this means that the density of the development – and therefore the number of saleable units – will be increased whilst enhancing the amenity of the area. For instance, provision of an attractive and comprehensive cycle network and good-quality cycle parking reduces the need for people to own a second car. Accordingly, future homeowners will find units more affordable because of the lower land requirement. Low-carbon transport is an essential component of development, if claims about sustainability are to be met. 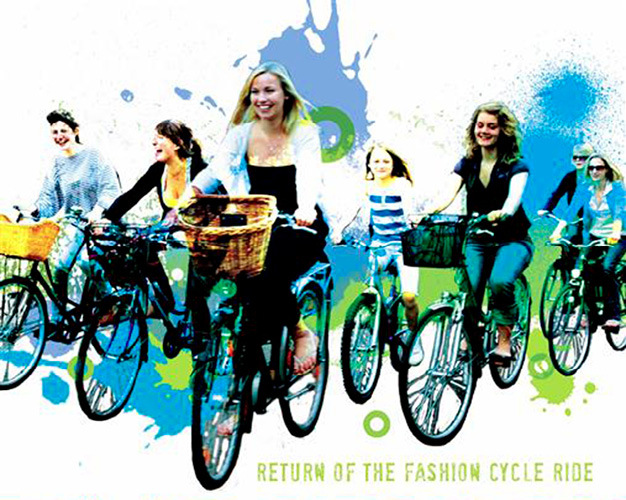 Cycling is a tangible and genuine way to demonstrate the sustainability of the development. A key benefit of cycling that is perhaps not obvious to those who do not cycle is the total predictability of travel times. This is most evident when cycle infrastructure in the development links fully to major office parks and railway stations. Traffic congestion is simply not an issue when travelling by bike. Advertising campaigns, depicting parents with children on everyday bicycles with wicker baskets, have proved to be an excellent way to market developments, associating the freedom and joy of cycling with the location and buildings. 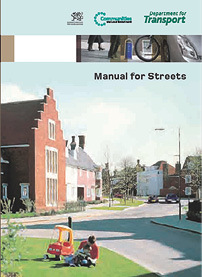 The Manual for Streets 2 (MfS2) is intended to bring about a transformation in the way streets are designed. MfS2 focuses on lightly-trafficked residential streets, though its principles may apply to other types of streets such as high streets. It replaces DB32 and other older guidance. It is eminently extremely relevant to new developments. We agree very strongly with its approach and with the vast majority of its recommendations. 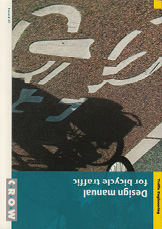 CROW-Record 25 describes best practice for the design of bicycle infrastructure as used in The Netherlands. We strongly encourage all developers to design the bicycle infrastructure in their new developments based on the guidelines from this publication. 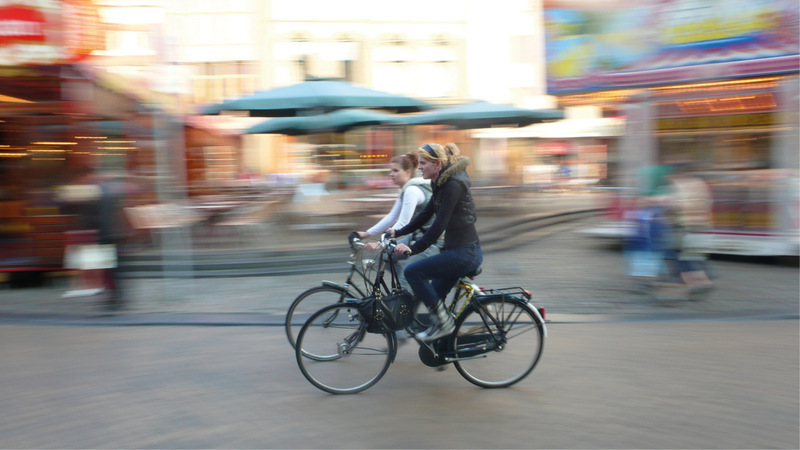 The Netherlands has significantly safer roads and much higher bicycle usage rates than the UK. 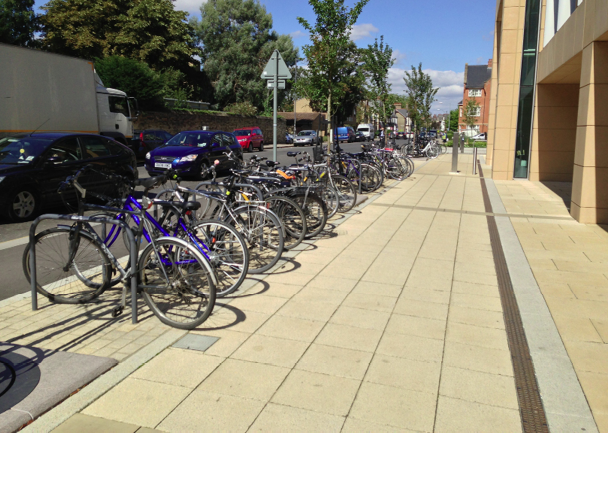 Cambridge City Council and other local authorities have adopted standards under the Local Plan to ensure that good levels of high-quality cycle parking are provided at all new developments. 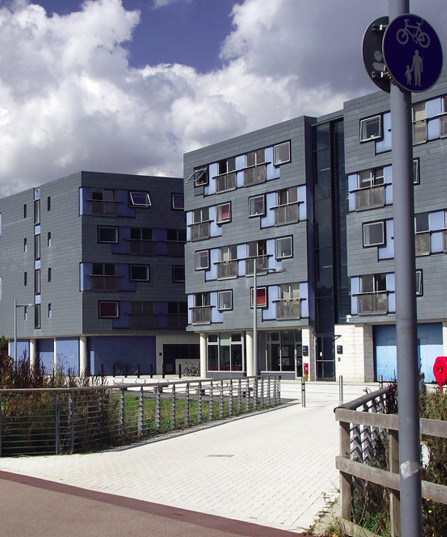 We strongly urge developers to ensure their developments meet at least these standards. CTC is the national cyclists' charity. Its briefings cover a range of topics focussing on six core themes: commitment to cycling; designed for cycling; off-road access; promotion and encouragement; safe drivers and vehicles; and public transport. The Chartered Institute of Logistics and Transportation has a wealth of information on active travel and travel planning. 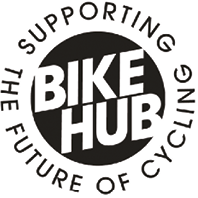 The information includes The Hub, a free source of carefully selected guidance, from the former Cycling England, for anyone working to get more people cycling. 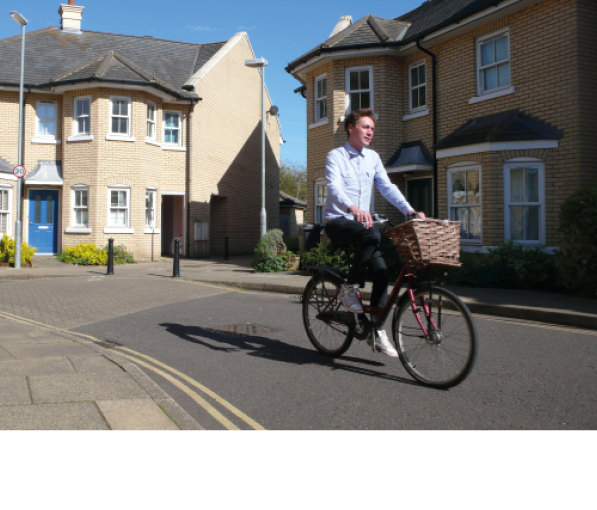 CPRE's Transport Toolkit will help improve local travel options and the streets where people live. Major organisations and bodies promoting cycling in the UK support the guidance in this publication. The Bicycle Association, on behalf of the Cycle Industry, is pleased to fund this publication. The future of everyday cycling is crucially linked to making our cities, towns and streets attractive for people to live and work. "Cycle proofing" every new development is a vital part of that. The industry is committed to supporting every effort to make space for cycling. Cyclenation, the federation of local cycling campaign groups, is helping local people push strongly for space for cycling on streets around the country. This guide, which we commissioned, and is generously funded by Bike Hub, represents best practice which shows developers and decision-makers how we can get more people cycling. 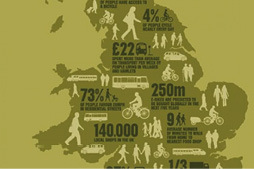 There are huge benefits to individuals and to society if we promote cycling and walking. It has health benefits, reduces congestion, and makes streets more human. This excellent guide shows us how to do it. Encouraging more people to cycle is a great way to create a healthy and attractive environment, for people and businesses alike. This guide provides excellent advice on how to do so, providing huge benefits for the local economy and our overall quality of life. 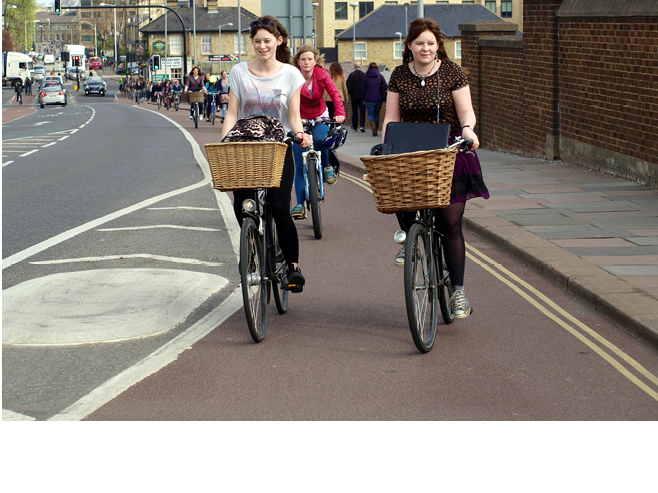 Two-thirds of people want to cycle more if it is made safer and easier to do so. Designing the needs of cycling in at the early stage of development, as this guide explains, gives people a real choice of how they get around. "This is the most ambitious attempt at outlining best practice in the UK that we have seen, and a huge step forward from the current guidance." Building a safe street environment depends on including, from the outset, safe and inviting infrastructure for people on bicycles. This guide gives the essential information needed to bring British design practice up to international standards. CPRE supports the designing of urban areas as attractive places to live so that people do not feel they must 'escape' to the countryside. This guide gives practical advice for pleasanter and safer living environments. 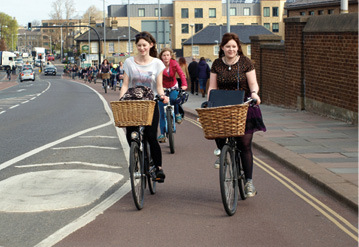 Cambridge proves that high levels of cycling are achievable in the UK. 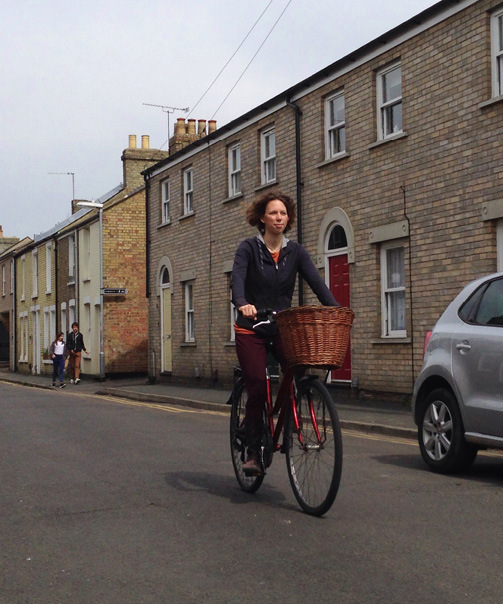 Growth of the city and the health of its economy are absolutely dependent on continued investment in cycling, and Cambridge is healthier for it. Authors: Robin Heydon and Martin Lucas-Smith. Sponsored by the cycle industry through its Bike Hub funding scheme backed by the Bicycle Association and independent bike dealers. ©2014. Text may be re-used under the terms of the Creative Commons Attribution Licence 4.0. Photographs copyright of their respective owners. Design by Ayesha Garrett, making use of concept in first edition by David Earl. Photos (some licensed CC-BY-SA) and illustrations by: Bicycle Dutch, Klaas Brümann, Tim Burford, Cambridgeshire County Council, Cycling Embassy of Great Britain, Nigel Deakin, David Earl, Ian Harvey, David Hembrow, Robin Heydon, Kevin Hickman, Richard Jennings, Martin Lucas-Smith, John Mallows, Alasdair Massie, David Morgan, Simon Nuttall, Beatrice Stude (Radlobby.IGF), Bike Train, Wheels for Wellbeing, Danny Williams. Use of a photographer's Creative Commons image does not necessarily imply their endorsement of the guide.